The Pyrenees hostel was built in 1974 from the hands of Teresa María and Rafael, although previously it was an Inn where travelers would spend the night. Currently, their son runs it. 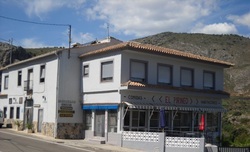 The restaurant is characterized by home-made, quality food, consisting of tapas, desserts, and traditional main dishes of the area, such as the "Olleta of Blat", soup with meat ball, shoulder of lamb, wild boar and pork knuckle, and many more. Also, we have other meats cooked on live coals. The restaurant has a bar area, two dining rooms, one inside and the other on the glazed terrace with a unique view towards the Valley of Guadalest. We also have an outdoor terrace with a breathtaking view of the Valley. In the basement is located a charming bar, to enjoy a few drinks with good company. It is also perfect for various functions such as New Year parties, Valentine's Day or Family Occasions.